To turn or not to turn: heeling, edging, chining, carving, J-leans - MITH (or was that myth?). Kayakers (river and sea), moving water paddlers, and freestyle geeks are all intimately aware of how the apparent hull shape can be changed or how the hull can catch water through tilting their boat. Unfortunately many lake and flatwater paddlers seem to have missed out on the fun somewhere along the line. Setting and holding an edge to create a new hull shape for carving an arc, circle, or turn, makes maneuvers easier, faster, and under more control within any paddling discipline. 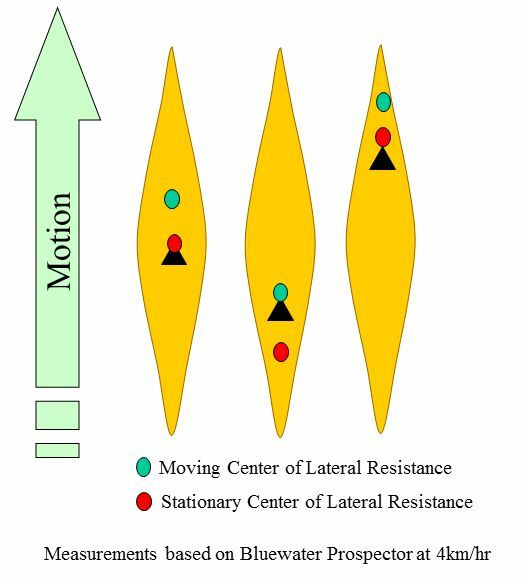 Surprisingly many flatwater and lakewater paddlers are resistant to using the MITH concept possibly because it is usually presented in a moving water context. In reality the need to understand and execute turns while holding a good edge is just as important when paddling longer 'lake' boats as it is in short banana shaped play boats: just ask the sea kayaker! I enjoy style (canoe dance) paddling and heel the canoe to change the hull presentation not only for doing turns and pivots, but also to maintain straight lines and sideslips. Even though I am a long time convert to heeling the canoe I recently had another reminder of the wider applications. I had the opportunity to paddle a longer lake canoe (almost Jensen style) and I was reminded how useful edging was in these boats. The reminder came not from the canoeing world but from sea kayaking. I was heading down a small river and was finding the canoe was turning like a barge - especially since my bow partner could not paddle - several times I had to stop, backup, turn and carry on.... My partner was not really comfortable with me tipping the boat but with some gentle encouragement, and a promise that we would not actually flip over, I was able to add a small tilt and from that point on going up and down the river was a breeze. OK, you say, tilting helps with turning the boat but on a lake how often do we need to turn? Landings, of course, come to mind pretty quickly but there are other situations where it helps to understand the hull shape and how it applies to turning the canoe: a) When solo you can paddle without correction strokes by tilting toward your paddling side (really big circle). b)Paddling with trailing (esp quartering) waves is often both difficult and a little scary. The waves try to push the back end of the canoe around as they approach, then the front end slides off of the wave as it passes. Understanding the importance of J-leans and hull shape will make paddling and holding a line in waves & swells much easier. d) Following little creeks and crossing beaver sloughs is a requirement of almost every trip I have been on and the ability to maneuver tight turns makes these little adventures less frustrating. d) many of us have had to maneuver around when doing rescues (not many in a real emergencies I hope). On flatwater pretty much anyone can man-handle a canoe around a circle or through a turn but why not make it easier with a little finesse. Now the big question: which edge and how much? Either edge - it depends. Most canoes with typical weigthing will turn into or towards the edged side. This is not always true as it also depends on trim and hull shape but it works in most cases (See the note bellow and diagram). Edging on the outside may work better in long straight keeled solo boats (e.g. Bell Magic, Clipper Freedom, We-no-nah Voyager) if the trim is flat or a little forward (skidding turn). Edging on the inside works better if the weight is back in the canoe. In moving water things change again since current and waves come into play together. In practice, on flat water, using either edge will allow you to carve a nice turn as it shortens the water line, adds 'rocker', and pulls the ends out of the water (slightly). Often it is all about initiation and momentum when entering the turn, then holding the edge throughout - the canoe will turn, and continue to turn, the way you started no matter which edge you use. Something to try if you are having problems getting your boat to go in a straight line. Move back in the boat, the bow seat is often enough, and heel the canoe to your paddling side. With the boat heeled it will start to turn toward the heeled side - the opposite way your paddling turns the boat. Now you just have to paddle forward - no corrective strokes. As you get more practice you can adjust your postion and heel to allow padding without corredion strokes from several positions. There are a number of references to a 'bow' wave that builds up or forms on the outside leading edge after a carve is initiated. This is more pronounced when forward weighted or when the leading edge is still in the water (little rocker). This 'wave' holds the canoe on the course that it has started. The term for this, as I found out recently, is pinning the bow (or a bow pin). Once a turn is started in a forward weighted canoe it tends to continue to turn - paddling against the turn the canoe goes straight. Eventually you will paddle through the turn (bow wave if you want), it is subtle. Although edging the canoe and hull shape are important there are other forces that need to be considered. How the force is applied through the use of the paddle and understanding where the force is in relation to the pivot point of the canoe. 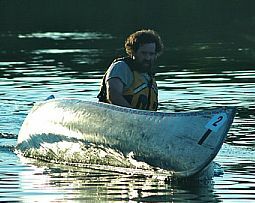 A great example of how edging a canoe works is completing a weighted-s turn. Once you have worked out the necessary weighting in your canoe and you feel comfortable getting the gunwale near the water this is a pretty easy trick on a calm day. Just remember Lake Canoeists can be Edgy Too! Westwood, Andrew. Canoe Techniques: MITH. Westwood Outdoors, 2010. A final Note: The images above are somewhat exaggerated but the waterlines are based on what would was modeled in freeShip and the extreme of my paddling positions. The tendencey for the boat to turn, especially when forward weighted, is completely overwhelmed by any small amount of intertia/torque in the boat. When forward weighted the trailing end of the boat acts as a long lever spining the boat in the direction initiated; the trailing end skids or washed out over the water and the leading end is pinned in the water. 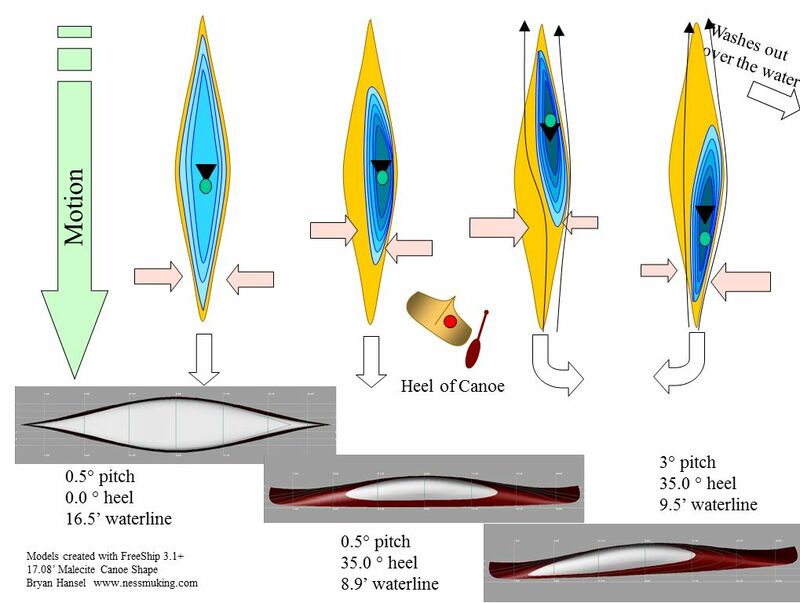 The shape of the leading/trailing edge of the canoe and how it enters/cuts the water along with the cross section of the hull (e.g. flat bottom and sharp chines, or round bottom) are also important factors and may mask the 'tendencey' mentioned above. I know I will get flamed if I don't point out that there is a lot of other things going on with regard to the boat turning. This discussion assumes that you somehow get your boat going in a straight line without paddling on one side (or the other), and your paddle pitch is perpendicular to the intended direction and center line of the canoe. Kind of like talking about physics in grade school - everything is done in a vacume with frictionless planes. It is still a reasonable model and does have relevance when paddling. When sitting near the middle of the canoe it will typically turn, and continue to turn, in the direction initiated. The following image provides an idea of how much the pivot point can move.